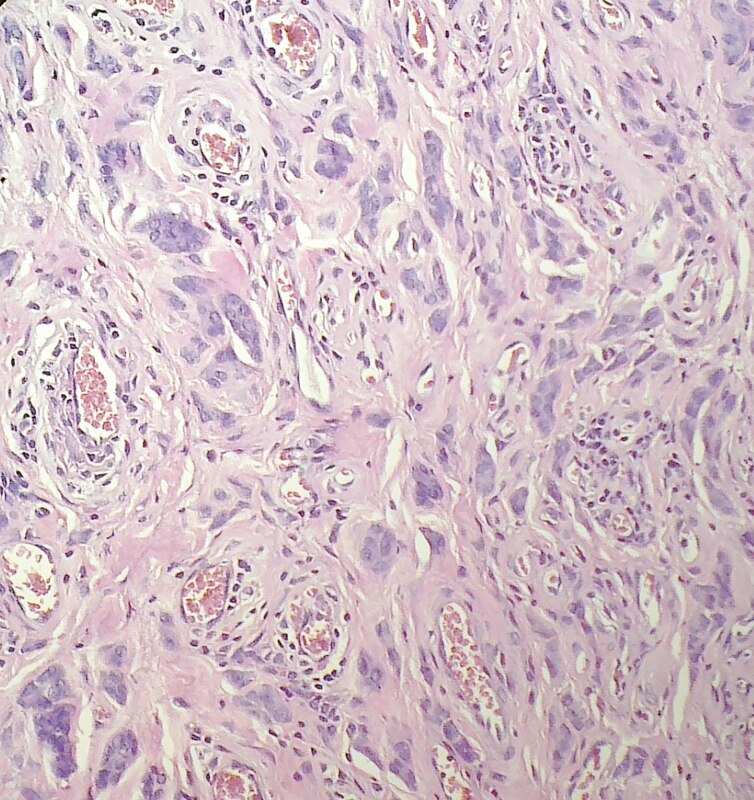 A 30 year old Asian woman presented with painless vulval swelling for the past 7 months. Clinically, it was diagnosed as a Bartholin�s cyst. At excision, the swelling was 2 cm, circumscribed and firm. 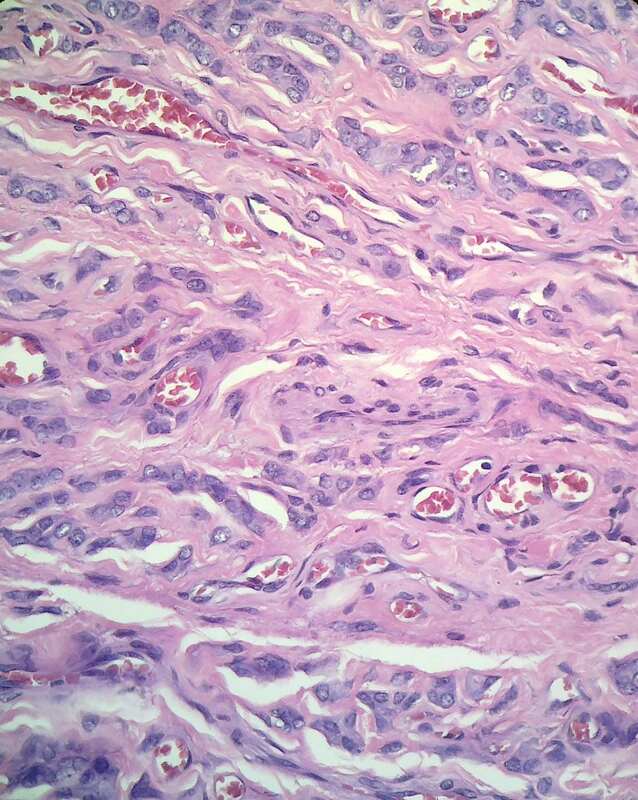 Grossly, it is well circumscribed, usually < 5 cm. 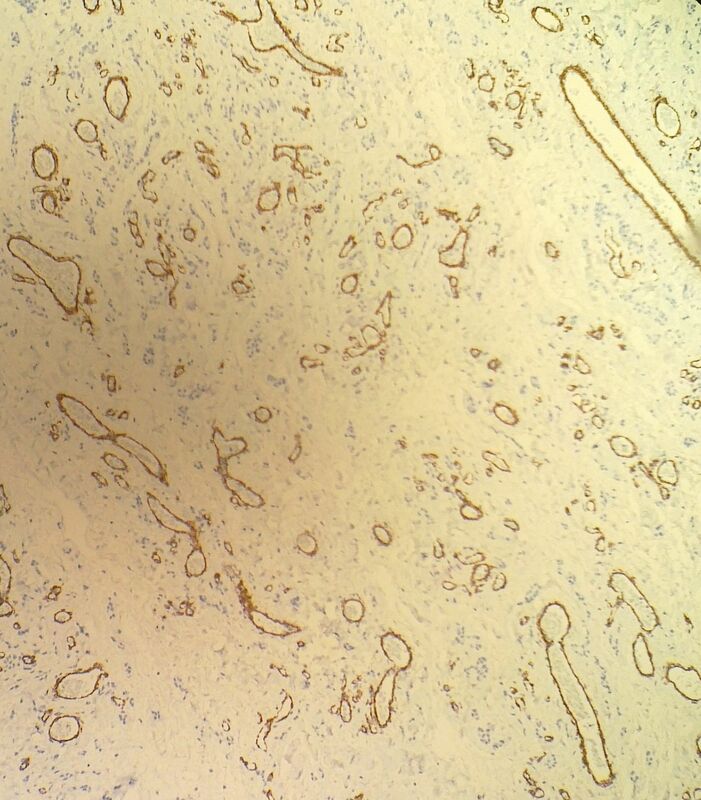 Histologically, there are alternating hypercellular and hypocellular areas composed of spindle cells and plump stroma cells, often in clusters, with eosinophilic cytoplasm that aggregate around small, capillary-like blood vessels. 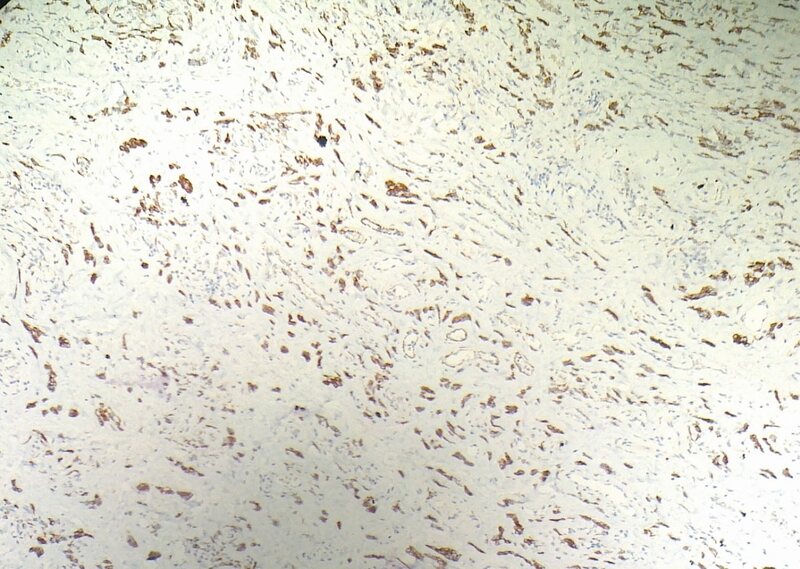 Mast cells are common. 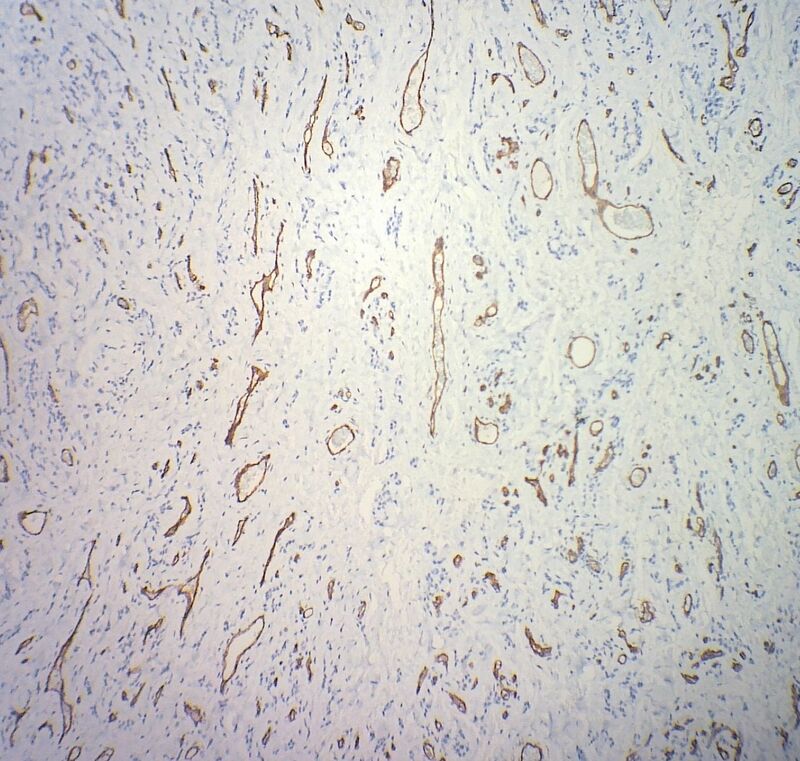 There may be binucleated or multinucleated cells. 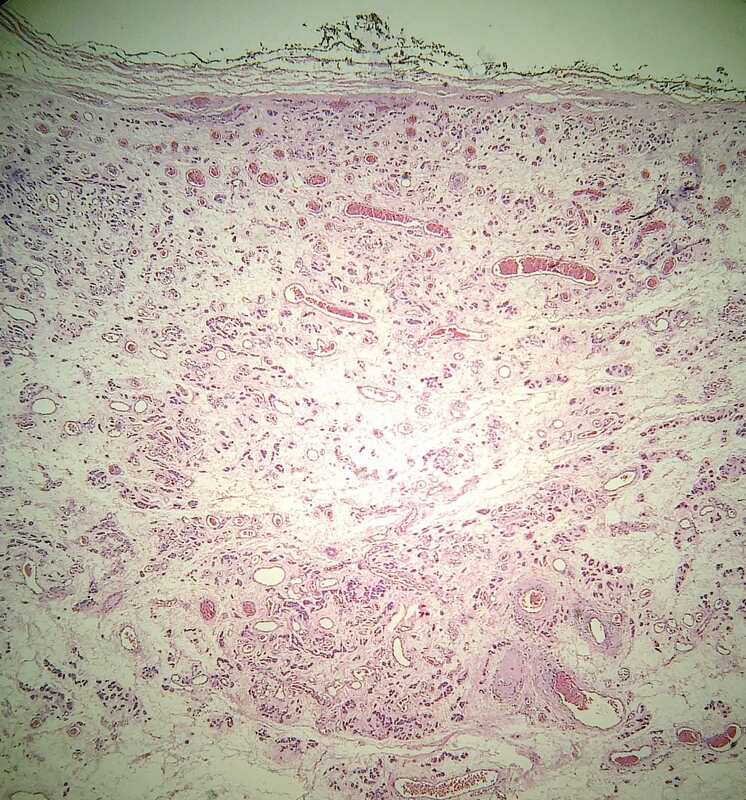 There is minimal stromal mucin, rare/no red blood cell extravasation, no atypia and rare/no mitotic figures. 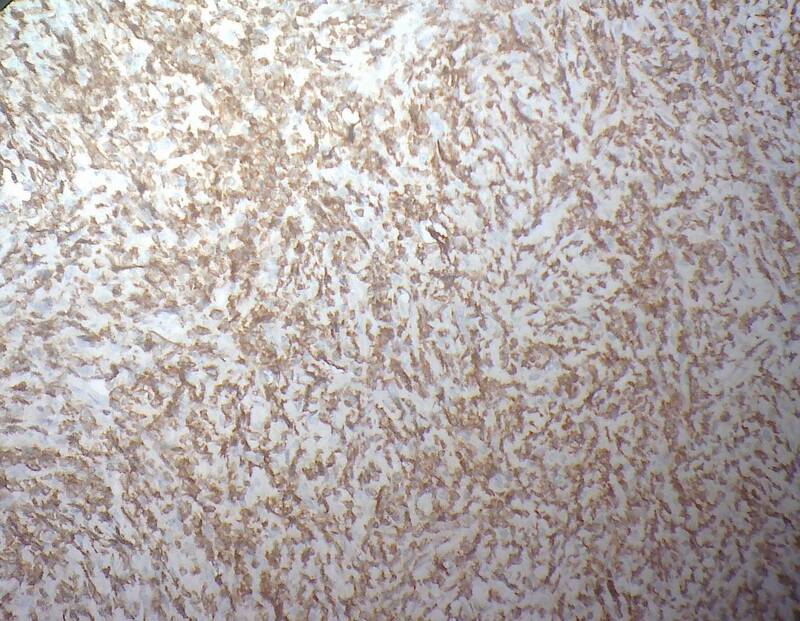 Angiomyofibroblastoma is immunoreactive for vimentin, desmin, ER and PR, and usually negative for keratin, S100 and actin (Mod Pathol 1996;9:284). 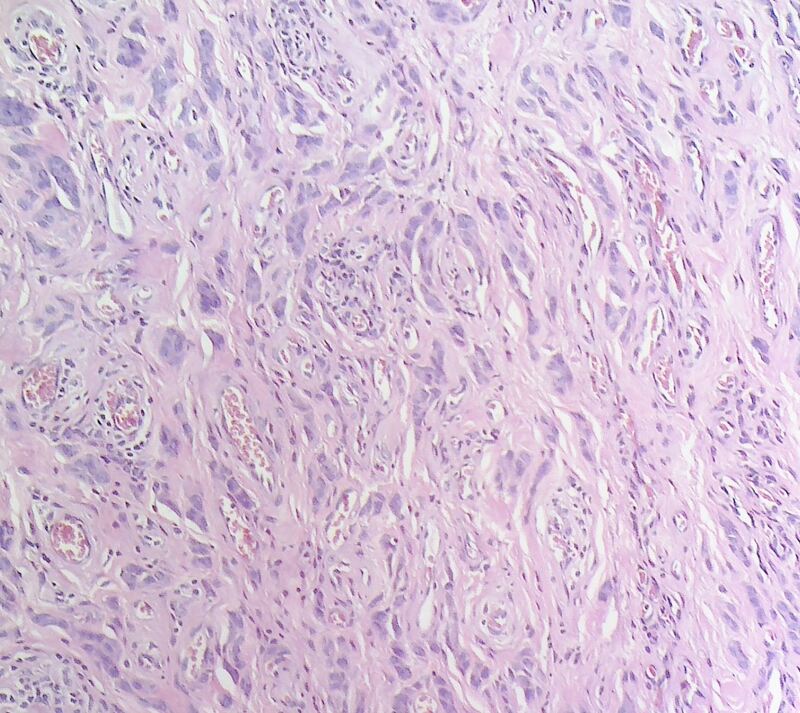 The differential diagnosis includes aggressive angiomyxoma. 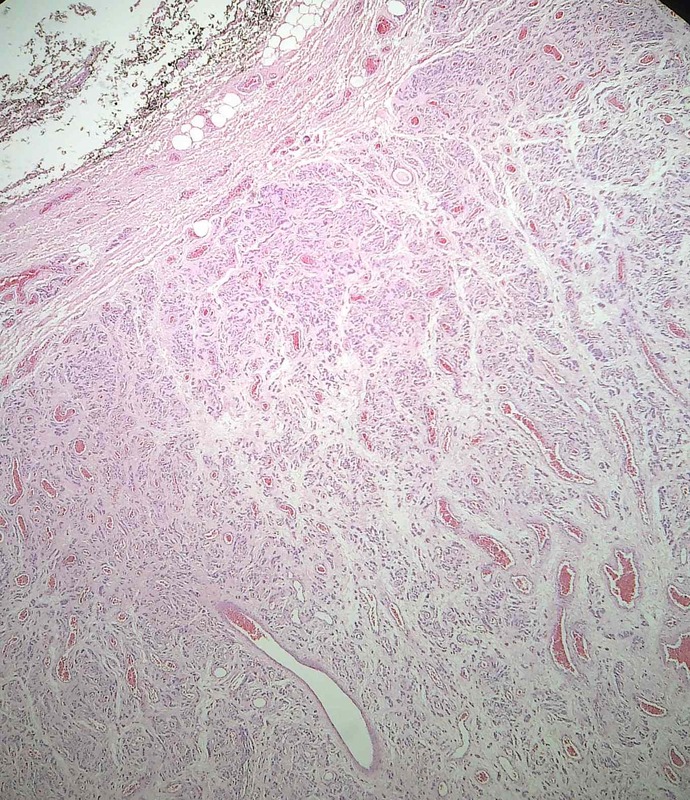 However, angiomyofibroblastoma has circumscribed borders, higher cellularity, more blood vessels (which lack prominent hyalinization), frequent plump stromal cells, minimal stromal mucin, and only rare erythrocyte extravasation. 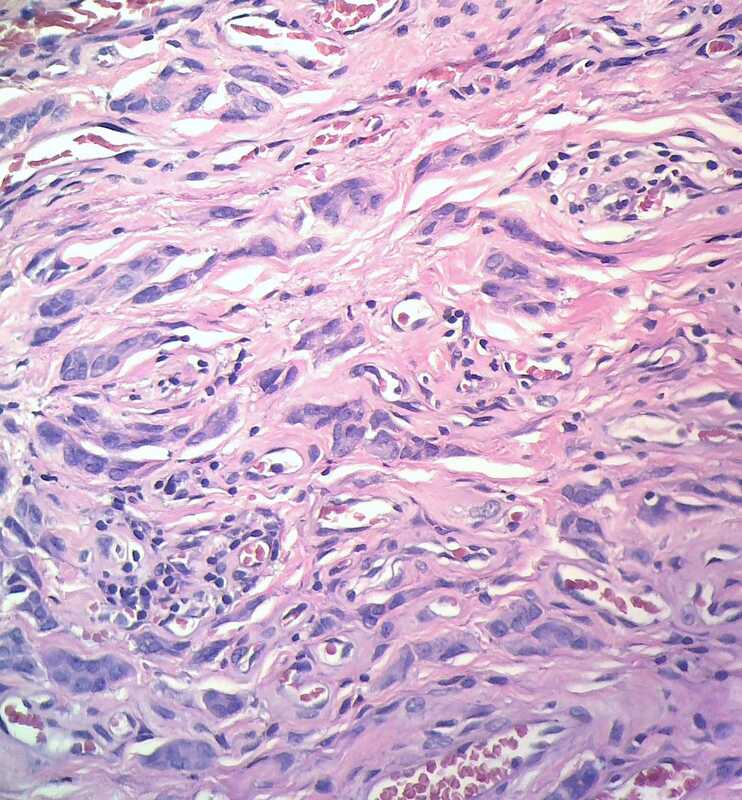 Cellular angiofibroma, also in the differential diagnosis, is uniformly moderately cellular, with hyalinized vessels and bland spindle cells, but usually no plump epithelioid cells (Stanford School of Medicine). 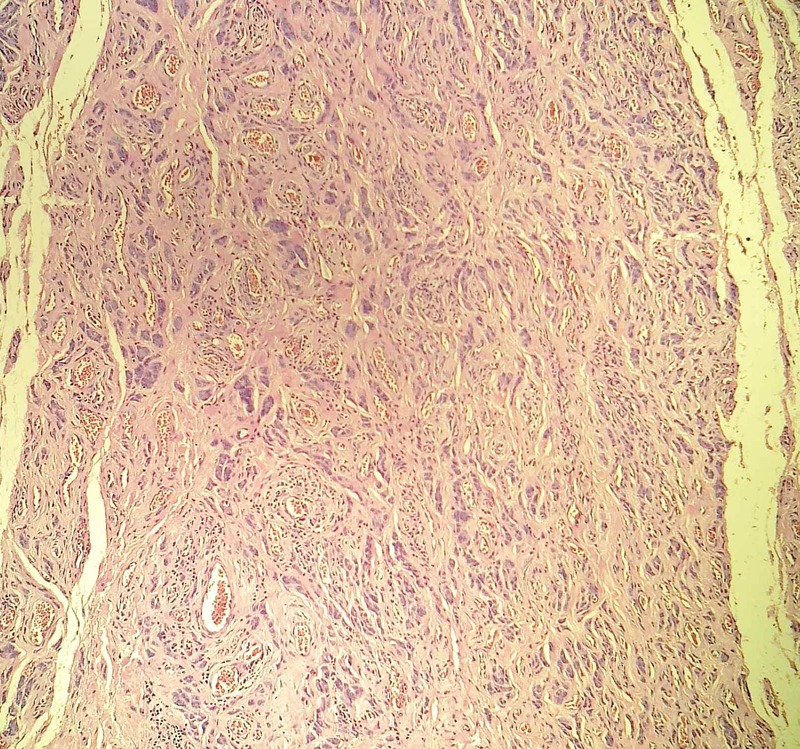 Angiomyofibroblastoma has benign behavior, and does not recur after excision.